For Thanksgiving this year, scholars from Harlem Prep Elementary and Pathways gave back to their community in a big way. Over the course of several weeks, each class collected canned goods in a box in front of their classroom, accumulating over 3,200 food items to donate to needy families in Harlem. Just before the Thanksgiving break, first-grade scholars from the Occidental College classroom gathered together with sixth grade Pathways scholars (as well as a few volunteers from Democracy Prep Endurance High School) to bring their donations to the Salvation Army. After a brief introduction to the work of the Salvation Army, including a short accordion performance, the scholars dispersed into the gymnasium to begin sorting their collected items into bags that would be distributed to hungry families. Daquan S. and Zamore A., two first grade scholars, put together bags of cereal, macaroni and cheese, and cans of vegetables. “Some people need food and don’t have money, so we’re helping them to have a big meal for Thanksgiving,” explained Zamore. “We’re being kind and respectful,” added Daquan. 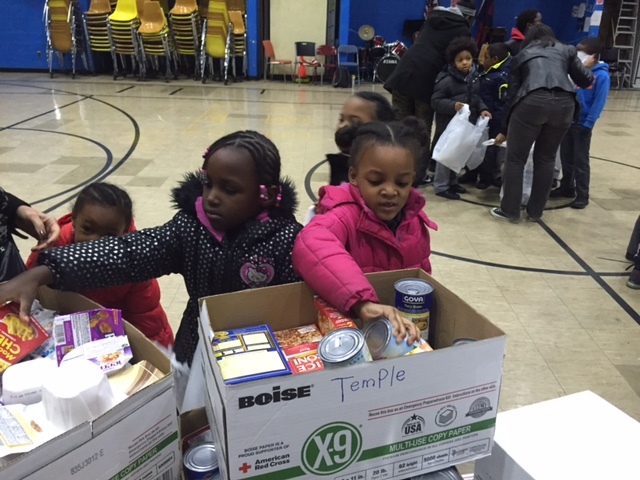 Chase M., a Pathways scholar, worked alongside his sister Trinity to package the donations. “I’m thankful for my family because they’ve always been there for me,” Chase said as he and his sister carried a bag together. Trinity, a first-grade scholar at Harlem Prep, agreed. Every elementary, middle school, and high school scholar pitched in and did his or her part to help others. Elijah S., a sixth grade Pathways scholar, diligently sorted pasta into piles for other scholars to bag. We’d love to know what you are thankful for. Share with us in the comments or catch us on Facebook and Twitter!